The Exped Hammock Mosquito Net turns a hammock into a comfortable haven from the bugs. 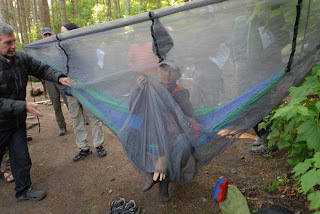 Designed to drape below the hammock so bugs can't bite through the taught fabric. Poles or sticks can be used at three points over the top to spread out the netting and increase internal volume. Get out of the biting horde and have a nice nap!